When it comes to Stan Lee cameos, we've all got our favourites. And there's plenty to choose from with the comic book creator appearing in many, many movies over the years, from 1989's The Trial of the Incredible Hulk to this year's Captain Marvel. Now that Lee has sadly passed away, his next few MCU cameos will mean all the more to fans. His Captain Marvel appearance was particularly amazing as it references his Mallrats cameo and we've no doubt that Marvel Studios has something equally awesome planned for his Avengers: Endgame cameo too. There's no word yet on whether or not Spider-Man: Far From Home will feature a Stan Lee cameo, so let's enjoy them while we still can. Here you'll find every Stan Lee cameo in the MCU, X-Men movies, and more, including his hilariously well-timed Fantastic Four appearance, his first speaking cameo in Hulk, and that time he gave the God of Thunder a hair cut in Thor: Ragnarok. Read on and remember the man who meant so much to so many. New Marvel movies | Best Marvel movies | Watch Marvel movies online | Best Marvel Easter eggs | How long do all the Marvel actors have left on their contracts? The cameo: Stan briefly appears as a jury member during the Hulk's trial. Is Stan the man? Banner is wrongfully on trial for sexual assault after trying to stop Wilson Fisk's men from attacking a young woman on a train and transforming into the Hulk. Matt Murdock, aka Daredevil, takes on his case and Stan appears in a courtroom scene. Hulk tears the room apart and the jury members subsequently flee in terror. This is the first time Stan appeared in a live-action Marvel-related film or television project. The TV film was a spin-off of the '70s Incredible Hulk series, starring Bill Bixby. The cameo: With Senator Kelly emerging from the sea as a mutant, Stan plays a hot dog vendor on the beach. Is Stan the man? Although this cameo was small, it began the tradition of Stan Lee cameos that's continued for a decade and a half. 20th Century Fox acquired the rights to the X-Men characters in 1994, and Bryan Singer's movie proved that Superman and Batman weren't the only comic book stars who could pull in big profits for movie studios, helping kickstart the superhero boom. The cameo: As Spidey and Green Goblin face-off for the first time in the film, Stan is part of the crowd being caught up in the furore. Is Stan the man? As debris falls during the battle, Stan pulls a young girl to safety. In the DVD extras he also appears in a deleted scene as a street vendor selling Peter Parker a pair of sunglasses and even has a spoken line: "Hey kid, would you like a pair of these glasses?" The cameo: We see Matt Murdock in a flashback to his childhood, stopping Stan crossing the road and getting hit by a bus. Is Stan the man? This is a reference to an incident in the comics, which was later omitted from the film. Stan's reading his newspaper as little Matt Murdock stops him from making the fatal error; Stan looks stunned as Matt walks away. Daredevil picked up mixed reviews, and Stan said later that they just wrote the whole thing wrong. Thankfully we got to see the character get the proper treatment in the excellent Netflix TV series. The cameo: Stan appears as a security guard. His colleague? Original TV Hulk Lou Ferrigno. Is Stan the man? Finally Stan speaks! This was Stan's first speaking role in a live action Marvel based film to make it into the final edit, and a real treat for fans to see him alongside Ferrigno. Director Ang Lee was keen to remain faithful to the legendary character and the comic so it seemed apt that the duo were seen together in the same scene. The movie is only a partial success, and the director would later admit that he should have had more fun with it, instead of all the psychodrama. The cameo: Stan saves a woman from falling debris as Spider-man and Doctor Octopus slug it out above. Is Stan the man? What is it about Stan Lee saving innocent folk from falling debris? He's a natural! More dialogue this time as Stan gets to speak again, saying look out while saving an innocent civilian. In a deleted scene which appears as a DVD extra, Stan has an extra cameo where he shouts, "Look, Spider-Man stole that kid's sneakers!" The cameo: Stan delivers some post to Reed Richards in the lobby of the Baxter Building. Is Stan the man? 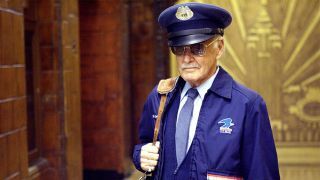 Stan doesn't play just any unassuming postal worker; he plays an actual character from the Fantastic Four comics. Willie Lumpkin first appeared in the 60s, and this cameo marked the first time Stan played a character he helped create. Willie's abilities include being able to wiggle his ears and nose. Unfortunately neither talent features in the cameo. The cameo: As Professor X and Magneto visit a young Jean Grey, she displays her powerful abilities affecting her neighbours, including Stan Lee's hose as he waters his garden. Is Stan the man? Stan's not the only legendary Marvel writer in this scene. Chris Claremont, the writer of the Days Of Future Past arc, also appears as one of Jean's neighbours. The cameo: As Peter Parker walks through Times Square, he stops by a signs that reads Spider-man To Receive Key To The City. Stan stops next to him to say a few choice words. Is Stan the man? "You know, I guess one person can make a difference," Stan remarks as they both stop in front of the sign, before leaving Peter with the Nuff said catchphrase he often used in his Stan's Soapbox editorial pages. The cameo: Stan is a rejected wedding guest at Reed Richards and Sue Storm's wedding. Is Stan the man? As guests arrive, Stan is stopped at the entrance, having being asked for his invitation. "I should be on that list," says Stan giving his name. He's rejected and quickly bundled away letting other guests by. This is a lovely little nod to 1965s Fantastic Four Annual #3. Stan is playing himself in the film; in the annual, Lee and Fantastic Four co-creator Jack Kirby are similarly turned away.